"As you continue preparation of the fiscal year 2019 Budget Request for the Department of Defense, we are writing to express our interest in a dual procurement of Gerald R. Ford-class aircraft carriers in the upcoming fiscal year," the legislators wrote in a December 20 letter to Secretary of Defense James Mattis. Procuring two carriers "allows the Navy to build to a fleet of 12 aircraft carriers more quickly as prescribed by the FY18 National Defense Authorization Act — which established that the Navy should maintain 355 ships, including 12 aircraft carriers," Rep. Rob Wittman (R-VA) said in a news release. Reps. Bobby Scott (D-VA), Bradley Byrne (R-AL), Joe Courtney and 127 more House lawmakers signed the letter supporting dual procurement. "If we are going to build a 355 Ship Navy, then we need to be smart and innovative in how we procure new vessels," Byrnes said in a news release, noting that he was "pleased so many of our House colleagues joined us in making this strong recommendation to the Pentagon." The dual buy saves $2.5 billion relative to buying ships one at a time, lawmakers said without specifying how those spending reductions would be realized. It would also provide more certainty to shipbuilders and contractors that produce aircraft carriers. Every House member from Virginia signed the letter, Newport News noted, which isn't surprising considering that the first Ford-class supercarrier is built in Virginia. The Newport News, Virginia, shipyard is the US Navy's only producer of nuclear-powered aircraft carriers. 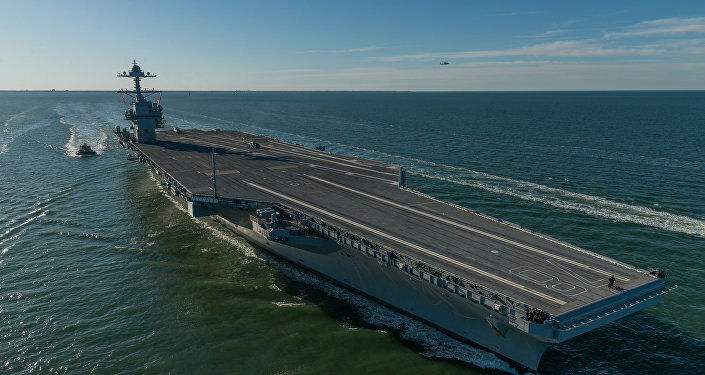 "The biggest difference between the Ford- and the Nimitz-class aircraft carriers of the previous generation is its ability to launch aircraft," Sam LaGorne, editor of USNI News, told Sputnik in June. "The entire aircraft carrier is designed around the idea that it can launch 30 percent more aircraft during a particular period than the Nimitz-class. That's kind of the central idea behind the Ford versus the Nimitz," he said. The namesake ship in the Ford class, the $13 billion USS Gerald Ford, was delivered to the Navy in June after multiple delays and cost overruns.